Cattle, as individuals or as a herd, possess many unique traits, the most distinctive being their social disposition. They are extremely social animals and rely heavily on "safety in numbers"— herds can form with up to 300 animals. Each animal can recognize more than 100 individuals and will closely bond to some herd members, while carefully avoiding others. While the bond between mothers and daughters is particularly strong, calves also maintain lifelong friendship with other herd members. It is thought that cattle were first domesticated in 6,500 B.C. from wild cattle in Europe and the Near East. 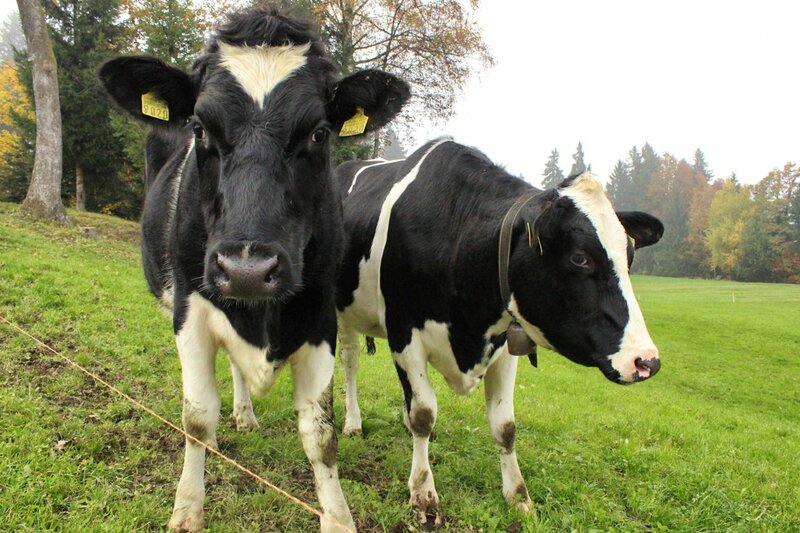 Only in the past two centuries have cattle been differentiated into breeds raised for beef or milk. Some cattle still exist as "dual purpose" breeds. People often refer to all cattle as "cows." Technically, cows are actually adult females who have, usually through having babies, developed adult physical characteristics. Heifers are young females who have not yet had babies or developed the mature characteristics of a cow. Male cattle can be divided into three groups: bullocks, steers and bulls. A bullock is a young, uncastrated male who has begun to display secondary sexual characteristics. A steer is a castrated male, whereas a bull is a mature, uncastrated male. Cows are sturdy yet gentle animals. They are social animals and form strong bonds with their families and friends that can last their entire lives. The bond between a cow and her calf is especially powerful. If a mother cow is caught on the opposite side of a fence from her calf, she will become alarmed, agitated and call frantically. If they remain separated, she will stay by the fence through blizzards, hunger, and thirst, waiting to be reunited with her baby. This bond continues even after the calf is fully grown. Cows "moo" to each other fairly frequently, allowing them to maintain contact even when they cannot see each other. But when they can see each other, they also communicate through a series of different body positions and facial expressions. Cattle usually stand between 4 feet, 9 inches and 5 feet, 6 inches, and “beef cattle” range from 850 to 2,500 pounds depending on breed and gender. In non-commercial herds, cows have been observed nursing their male calves for up to three years. Cattle have almost panoramic vision, which allows them to watch for predators or humans. They can see in color, except for red. They have an amazing sense of smell, and can detect scents more than six miles away. Cattle are ruminant herbivores and will swallow vegetation whole, then later masticate their "cud" (chew their partially digested food). The scientific name for the cattle group is "bos taurus," a subfamily of the bovidae family, which includes other hollow-horned animals. Interestingly, bulls are much less likely to use their horns than cows. However, the level of aggression can be influenced by the degree of confinement. Cattle will learn from each other's mistakes: If an individual is shocked by an electric fence, others in the herd will become alarmed and avoid it. If a herd is confined by an electric fence, only 30% will ever be shocked. Cattle enjoy swimming and running in the moonlight, as they have been shown to remain active for a longer period between their two sleep sessions when the moon is full. The lifespan of cattle averages 20 to 25 years. However, the lifespan of cattle raised for beef is significantly shortened. These animals are typically weaned at 6 to 10 months, live 3 to 5 months on range, spend 4 to 5 months being fattened in a feedlot, and are typically slaughtered at 15 to 20 months.